Big Heavy World loans vans to Vermont bands because skinnydipping in the Pacific Ocean is every touring musician's birthright. And sometimes it helps to build an audience in other states, or just move big musical stuff. Big thanks go out to Good News Garage who helped us launch this program; the University of Vermont; and Dealer.com. Van at Good News Garage. Big Heavy World makes tour vans available as a cooperative effort with Vermont-based musicians. 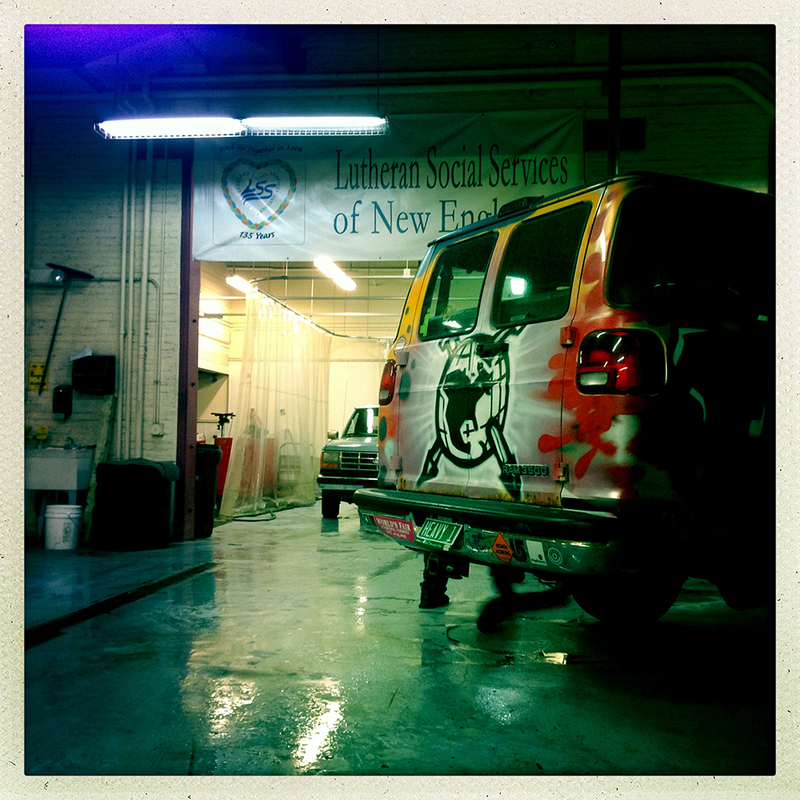 Our first van came to us through a partnership with Good News Garage. Our second was purchased at auction at the University of Vermont. We're down to one now, but make it available to Vermont's musicians who couldn't tour without a van like this. Big Heavy sends special thanks out to Dealer.com and Lake Champlain Chocolates for their support of the van in 2016! We make as good an effort as possible to keep the vans on the road - that means that when resources are meager, the vans end up grounded now and then. Keeping them rolling with regular maintenance and insurance paid for is a cooperative effort between us and the bands that borrow them - see the agreement below and you'll follow along. If you're a Vermont musician who wants to borrow a van or is willing to pitch in and make them possible by hosting a fundraising performance, please contact us. Special thanks to Big Heavy World and the van that drove us 1700 miles safely and very comfortably in rock star style. We hated even turning the van in.... It's like part of the family. The part we could not have done this tour without. In a group as big as Funkwagon it's rare to all be in the same car. Thanks so very much for support and use of the Big Heavy Van. Ryan Power March Tour powered by Big Heavy World. Jim Lockridge and his crew help make Burlington Vermont's music scene come alive, we are honored to know and have such folks as friends. Take hi-rez pics of you guyz with the van on the road, for the 'Van Diaries' blog at bigheavyworld.com and send them to Big Heavy World, and when you're back, email a bloggy note about the tour to go there, too, within 48 hours of return. Check the oil while you're on the road and make sure the van gets back to Burlington, no matter what, with as much or more gas as it left with. When you're back, detail the van at 56 King Street within 48 hours - make it pretty and smell good again. A vacuum cleaner, garden hose, and cleaning supplies are in the garage. Feel welcome to BBQ on the house grill while you’re there. Put a van benefit show together that will help with maintenance, repairs, improvements and insurance. Send details so we can post them on the web site. There is no alcohol or smoking (of any kind) permitted in the van. BHW vans are used by youth programs and straight-edge groups and cross international borders. Mess this up for us and find your own ride next time. There’s no guarantee if the van is reserved for you that it will actually be available. It might have repair issues etc. that are unexpected. Don’t blame Big Heavy if this happens – the van’s a freebie, and we’re not a corporate rental company. But you knew that. If all these rules don’t make you grumpy, represent for VT music / bigheavyworld.com! Remember to take the time to check the van out before you go, make sure you're psyched about it! It's thirteen years old and you’re borrowing it 'at your own risk' (see the liability waiver, below). "Jim at Big Heavy World lent us the van for a big move of equipment to Brooklyn NY. The fact that we even got the van is a testament to two things: 1.) The magic of social media, 2.) The magic of Burlington's musical community. After looking at the prices of UHaul rentals, I posted on Facebook that I was in need of a van. Within minutes people told me about the Big Heavy van. I couldn't believe it! Big Heavy World is so dedicated to seeing musicians succeed that they even help us with transportation? The van drove smoothly and made people smile along the way. In Brooklyn, folks stopped to take pictures of it with their phones. In a world where being a musician can really make you feel defeated much of the time, it's a breath of fresh air to come accross Jim and Big Heavy World. Their dedication to keeping our "wheels moving" is nothing short of inspiring." I , (___(You___), an authorized representative of ___(Band or Organization)___ withhold from any and all liability and responsibility for injury, death, property damage, or other damages, costs, or expenses howsoever incurred that anyone may suffer as a result of use of the Big Heavy World van. Also, I agree to hold harmless and defend Big Heavy World and its staff and volunteers from and against any and all claims, actions, causes of actions, demands, liabilities, losses, costs, damages or expenses of whatsoever kind or nature. Unfortunately, we are currently bootless and unhorsed, so to speak. We hope to procure another van so the rest of the country can discover the great music being made in Vermont.